Indications: Pain reliever prescribed for moderate to severe pain. Summary Recommendations: Tramadol, commonly prescribed as ConZip, Ryzolt and Ultram, is used to relieve moderate to severe pain. Patients taking Tramadol for pain relief should contact the prescribing physician immediately if they find out they are pregnant. Tramadol must be taken as prescribed. Taking more than the prescribed amount may increase the risk of side effects or death. General Precautions: Tramadol is a potentially habit-forming pain reliever. Patients with a history of addiction to drugs or alcohol should not take Tramadol. If you are currently taking medications for seizures, depression or anxiety you should not take Tramadol. Patients with a history of mental illness should speak with the prescribing physician about alternatives to Tramadol, especially if the patient has a history of attempted suicide. Tramadol is contraindicated in patients taking narcotic pain relievers or sedatives. If you suffer from kidney disease, liver disease, stomach conditions or mental illness, Tramadol is not for you. Tramadol can be addictive. If you feel the need to take more than the prescribed amount of Tramadol for pain relief, contact the prescribing physician immediately. If you have taken more than the prescribed amount, seek emergency medical attention as overdose can cause death. Common side effects reported when taking Tramadol include dizziness, nausea, constipation, anxiety and drowsiness. More severe side effects may include seizures, skin rash or breathing problems. Seek medical attention if you feel you are having side effects to Tramadol. Effect While Trying to Conceive: Tramadol intake of nearly two times that prescribed to humans had no effect on male or female fertility in animal tests. 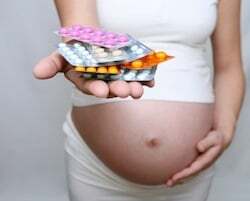 Effects on Pregnancy: Tramadol is in pregnancy category C, which means the Food and Drug Administration has not ruled out possible effects on the fetus. Animal studies have shown toxicity to the embryo and fetus, but human studies have not been completed. Tramadol crosses the placenta to the fetus. At least one case of withdrawal in a newborn has been reported in an infant born to a mother taking Tramadol during pregnancy. Safe During Breastfeeding: Tramadol passes to the infant in breast milk, but studies have shown the amount passed is lower than the amount prescribed to infants for analgesia. Mothers are advised to watch for excessive sleepiness, difficulty breathing and limpness in infants. If your infant appears to be affected by your Tramadol intake, doctors may choose to step down the Tramadol and prescribe a different pain medication.